- Mary Pope Osborne, author, "Where Beauty Lies Next to Violence and Despair," The Suspension of Time, 2011"
- Mary Pope Osborne, "Where Beauty Lies Next to Violence and Despair," The Suspension of Time, 2011"
The evening will begin with a performance by Simone Dinnerstein of three of Bach's Chorale Preludes and Schumann's Fantasiestücke. 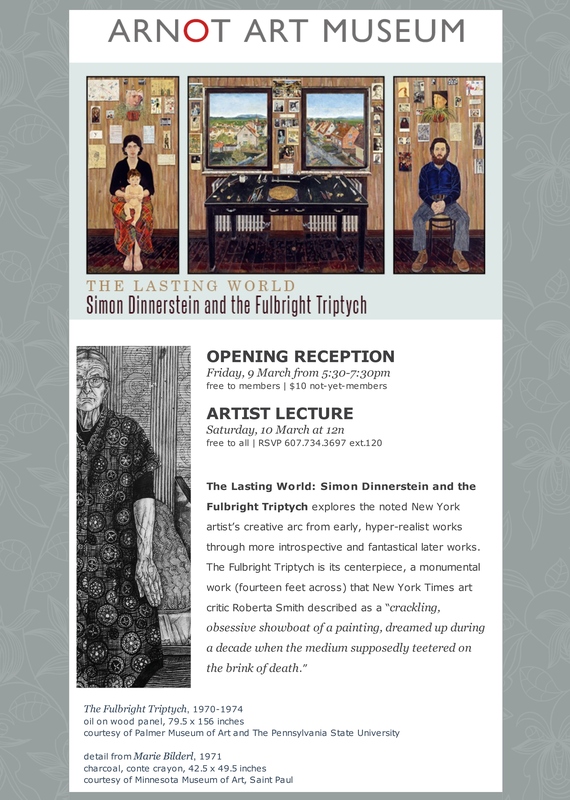 Following the on-stage discussion and a Q & A with the audience, Simon Dinnerstein will sign copies of his new book, The Suspension of Time: Reflections on Simon Dinnerstein and The Fulbright Triptych. Location and time: Tuesday, July 26, 2011, 6 p.m.
which will be on view through September 15, 2011 at the German Consulate General. 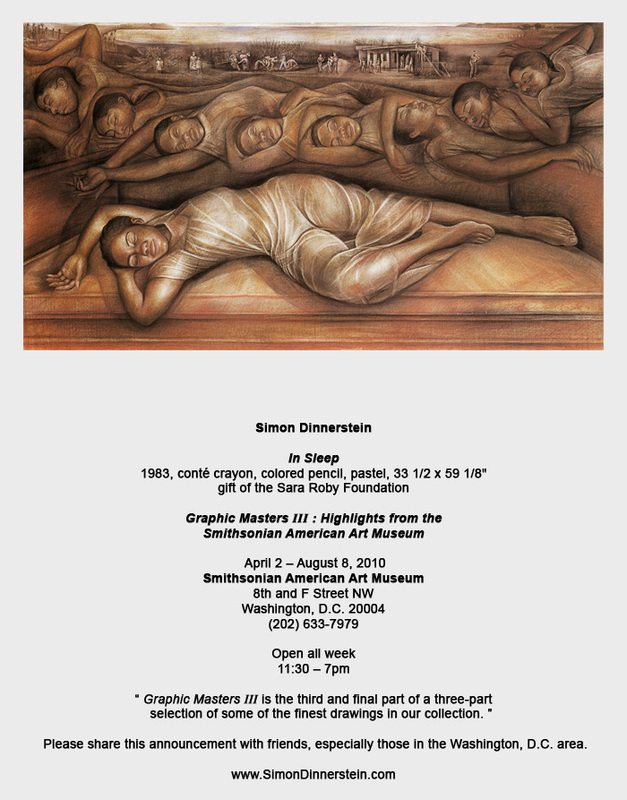 Christian Daciuk, co-owner of Loupe Digital, has administered and maintained the website of Simon Dinnerstein. 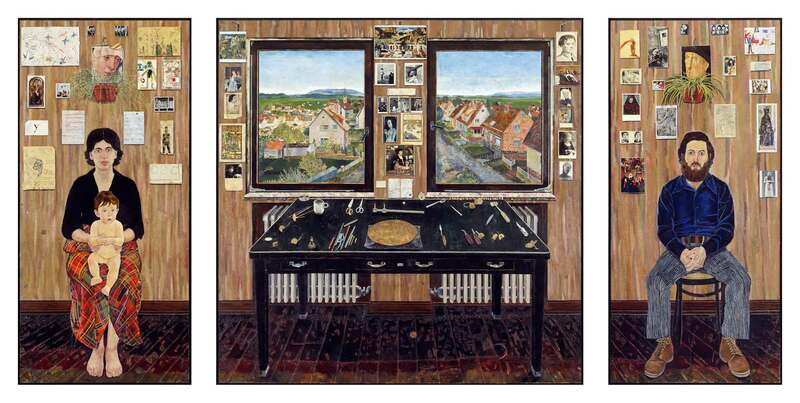 In addition, he has printed a dramatic series of giclee or inkjet prints of Dinnerstein’s work. These prints are richly produced with permanent inks on archival paper. Milkweed Editions is an independent literary press based in Minneapolis. Since its founding in 1979, Milkweed Editions has published some 250 titles, and they currently publish 15-20 books yearly. A nonprofit organization, Milkweed is funded by revenue generated by sales of the books it publishes, and by the generous support of individuals and institutions across the country. 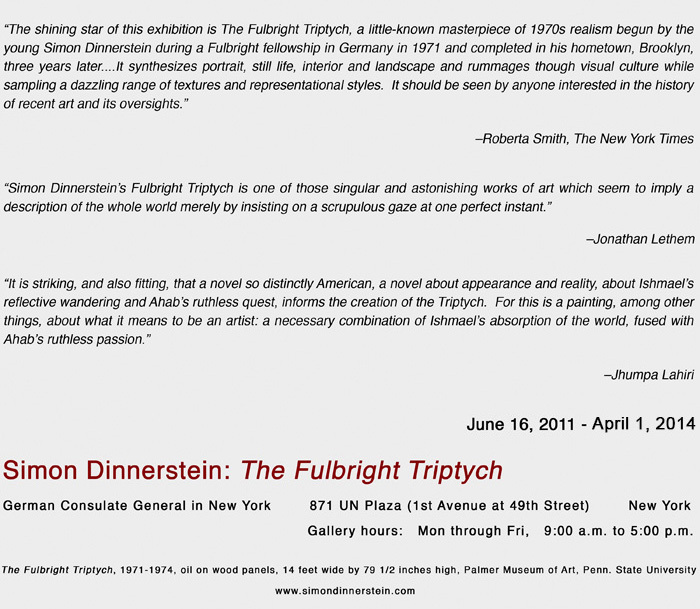 In early 2011, Milkweed Editions will publish an anthology of reflections on Simon Dinnerstein’s monumental painting, The Fulbright Triptych. 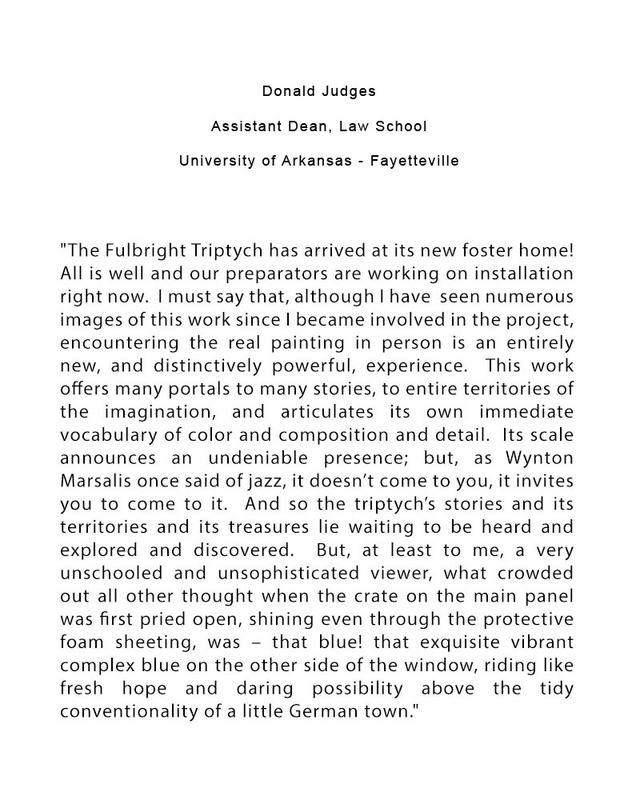 Using The Fulbright Triptych as a prism or point of meditation, a wide range of contributors—including, among others: Jhumpa Lahiri (author), John Turturro (actor), George Crumb (composer), John Russell (writer, art critic), Edward Sullivan (art historian, writer), Guy Davenport (essayist), Dan Beachy-Quick (poet, essayist), Dinitia Smith (author), Colin Eisler (art historian), Phillip Bruno (gallery dealer), Louis Menashe (film critic), Anthony Doerr (author), Rudolf Arnheim (psychologist, writer), Thomas M. Messer (Director Emeritus, Guggenheim Museum), Albert Boime (art historian), Virginia Bonito (art historian), Thalia Vrachopolous (art historian/curator), Nancy Ekholm Burkert (artist/illustrator), Mary Pope Osborne (author), Daniel Mark Epstein (poet/biographer), Alvin Epstein (actor), Robert Beaser (composer), Valerie Sayers (author), Michael Feldberg (historian), Miller Williams (poet) and Simone Dinnerstein (pianist)—will illuminate this American masterpiece in fascinating ways. 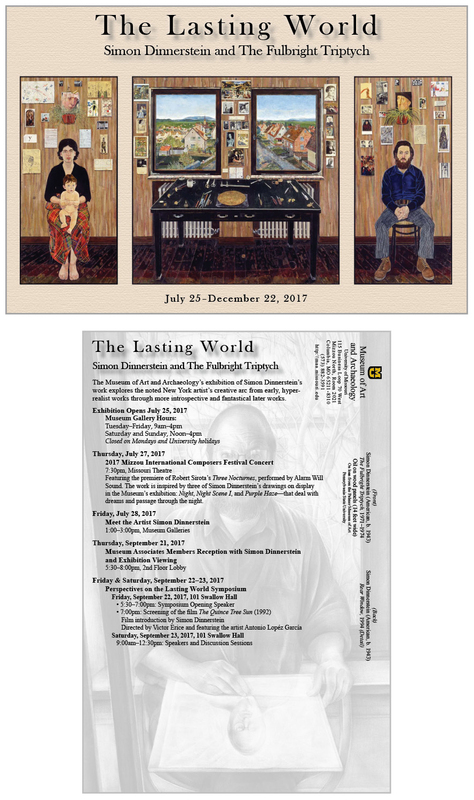 Loupe Digital is pleased to present this exhibition and sale of Simon Dinnerstein’s giclee prints as a benefit for the upcoming book. During the course of the exhibit, the prints will be reduced in price. 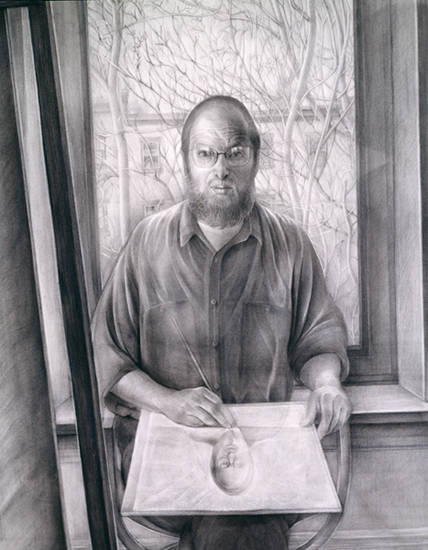 Simon Dinnerstein, Rear Window (detail), pencil , powdered graphite , 75 3/8 x 40"
Call 718.833.9100 for events and schedule updates. Opening at Tabla Rasa Gallery on Wednesday, November 4th, ABOUT FACE offers selections curated to turn around the viewer's expectations of the human face in art. 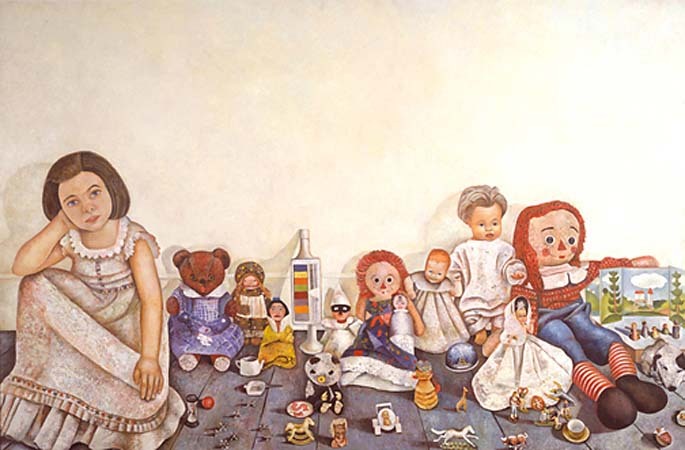 Whether obscured, distorted, psychologically askew, or oversize in scale, none of the works resemble traditional portraiture. 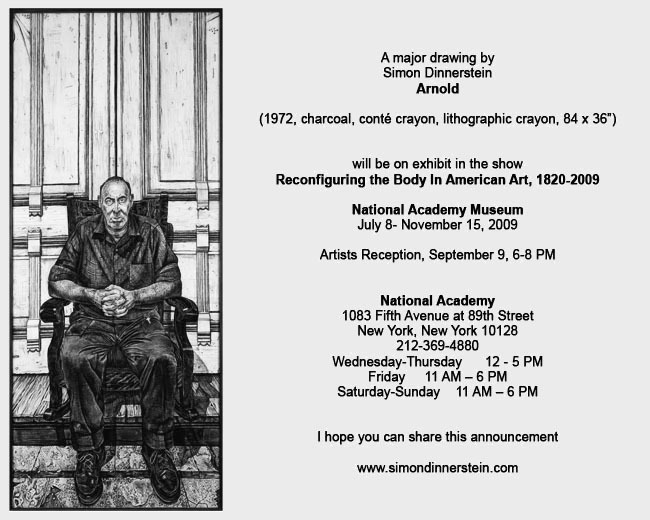 Renowned Brooklyn artist, Simon Dinnerstein has had eighteen one-man exhibitions and has received a Fulbright Grant to Germany and a Rome Prize to work in Italy at the American Academy in Rome. 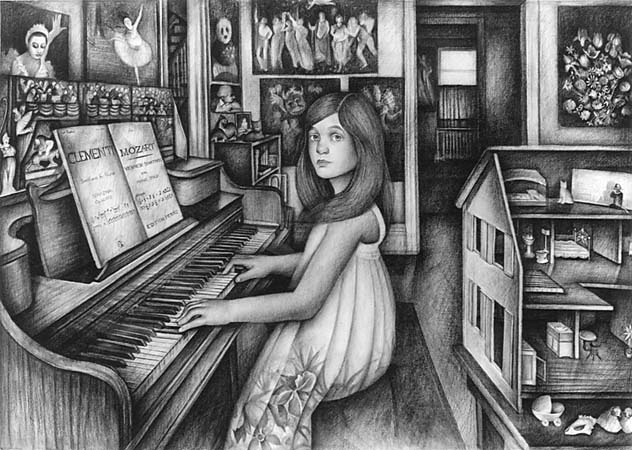 Dinnerstein has been the subject of two monographs on his work (University of Arkansas Press and Hudson Hills Press). A third book is planned for early 2011 by Milkweed Editions (Minneapolis).This book will be in the form of an anthology of writing focusing on a major painting of his, The Fulbright Triptych. 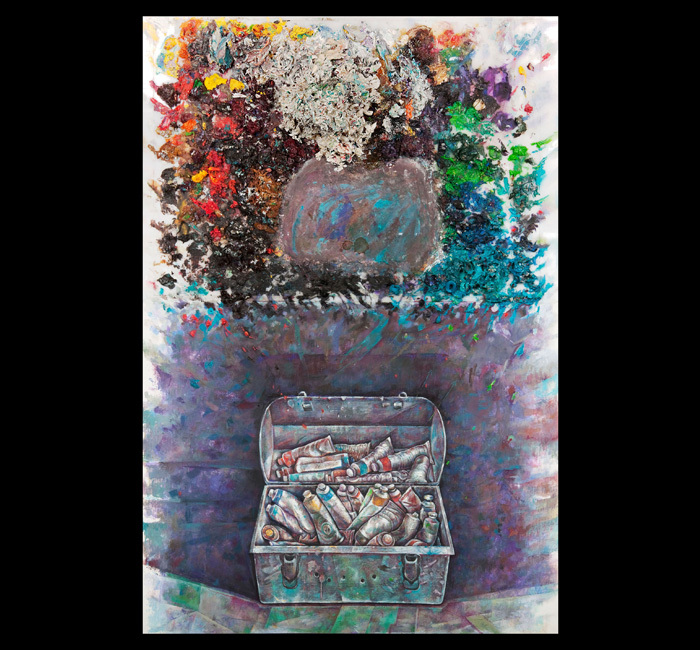 It will consist of 42 essays using his painting as a prism or point of meditation. 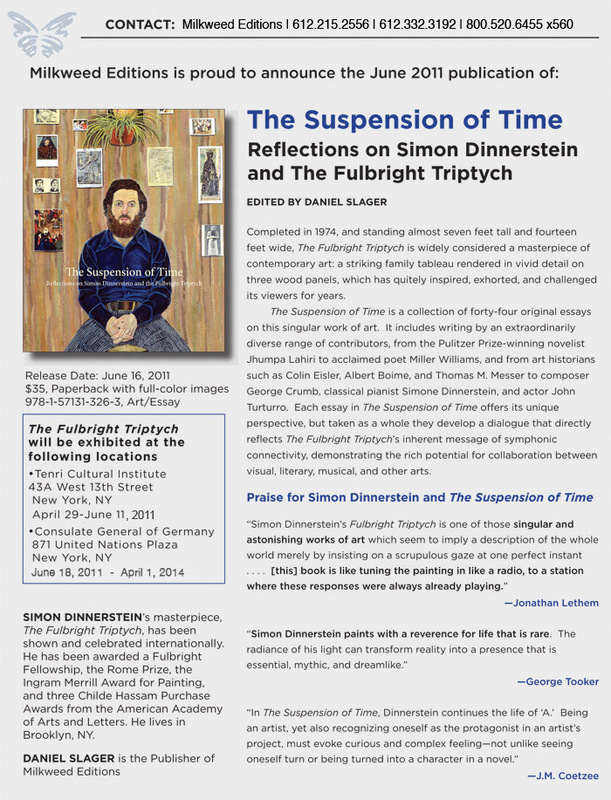 The Triptych, which is 14 feet in width, can be viewed at: http://www.simondinnerstein.com/the_fulbright_triptych.html New York exhibits of the triptych are being planned to coincide with the publication of this book in 2011. The works in this exhibition demonstrate his mastery at balancing drama and subtlety, with the seductive finesse that followers of his work will recognize as his unique signature. Among the other artists exhibiting in ABOUT FACE are Jeannine Bardo, Stephen Basso, Anita Giraldo, Clarity Haynes, Kiseok Kim, Alexandra Limpert, Alex Pimienta, David Prifti, Stuart Shedletsky, and Larry Siegel. Original contemporary paintings, photographs, sculptures and works on paper will be on display. The gallery is located two "D" or "N" express subway stops from Manhattan to the 36th Street Station plus one "R" stop to 45th Street. Tabla Rasa Gallery is free and open to the public. 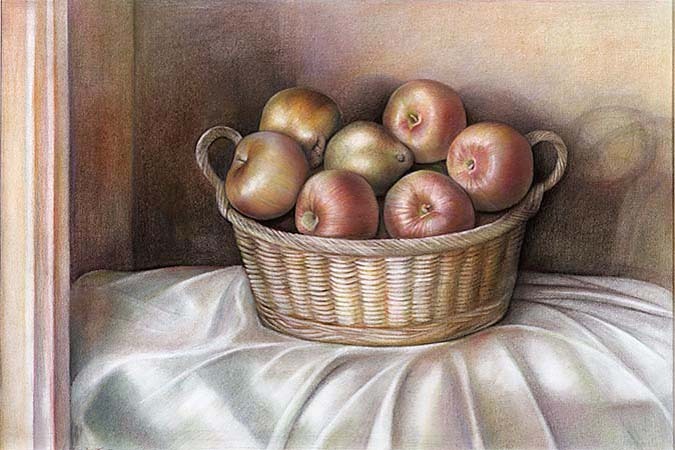 There will be an artists’ reception on Wednesday, November 4th, from 5:30 until 8:30 pm. General gallery hours are Thursday, Friday and Saturday 1:00 until 5:00 pm. ABOUT FACE remains on view through January 23, 2010. Call 718.833.9100 for additional hours, events, and schedule updates. New York, NY - Howard Stern Show Radio personality Robin Quivers and her charity-focused dinner committee Girls Night Out will host A NIGHT OF MUSIC AND ART WITH THE DINNERSTEINS, which takes place on April 17th at the Rainbow Room in New York City. The dinner will benefit Healing Bridges, a non-profit organization that creates jobs in Africa for women to support themselves and their families and help fund their new business ventures. For more information on Healing Bridges go to www.Healingbridges.org. The evening will feature the music of Simone Dinnerstein, the acclaimed American concert pianist who the New York Times called an artist “poised for a breakthrough,” and whose recent recording of Bach’s Goldberg Variations earned the No. 1 spot on the Billboard Classical Chart in its first week. 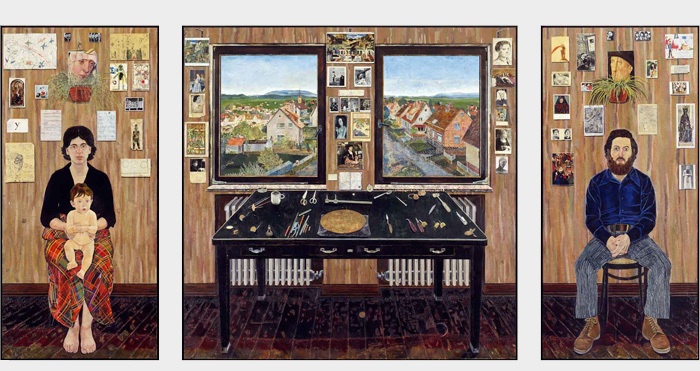 The night will also feature the art of her father, the celebrated painter Simon Dinnerstein of Brooklyn, NY whose work has been featured around the world. Cocktails begin at 6pm, followed by dinner and the performance. Special celebrity seating will soon be available on www.charityfolks.com. VIP tickets are $1000 and all other seats are $350. Information on purchasing tickets can be obtained via email to [email protected] or by telephone at 646-435-1548. May – early summer – Tabla Rasa Gallery will present Bridge as Icon, an exhibit to celebrate the 125th Anniversary of the Brooklyn Bridge. Purple Haze will be on display. A giclee print of Purple Haze will be available from the artist and at Tabla Rasa Gallery during the exhibit. 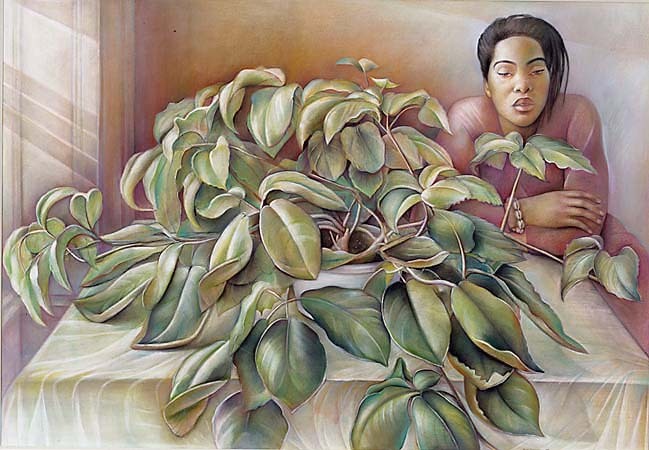 For more information about this exhibit and for directions to the gallery, go to HYPERLINK "http://www.TablaRasaGallery.com"